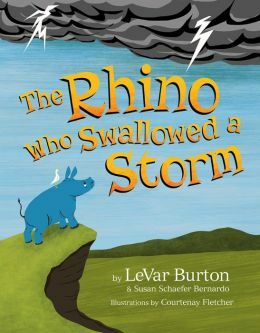 Posted on November 7, 2014 by Patricia Tilton •	This entry was posted in Healing, LeVar Burton & Susan Schaefer Bernardo, Perfect Picture Books, Tragedy and tagged Coping, Emotions, Feelings, Friendship, Natural Disasters. Bookmark the permalink. It really is a beautiful story and book! Great discussion book for kids. Wow! The cover and title were intriguing enough to make this non-picture book person take a closer look. And your description of the text was powerful. To top it off, I grew up watching public television and I loved the Reading Rainbow guy! And now I know his name, lol. I know, the cover and illustrations are great and follow the little rhino’s mood as he makes his journey. I wasn’t familiar with the Reading Rainbow — wrong decade. Glad you’re so enthusiastic. It really is a beautiful book. Great book for Matthew. It’s quite a story and the illustrations are gorgeous. You’d appreciate Susan’s rhyming. She wrote my all time favorite book on separation and loss, which I mentioned in the review. I saw this on TV, and though I often shy away from celebrity authors, was eager to get a better look. LeVar Burton is a true champion literacy and has seen plenty of good picture books in his time. I am glad to hear that he and his co-creators have turned out a valuable and charming picture book. Thanks for the review. Yes, he has been a champion for literacy for many years. This is a wonderful collaboration. Susan is excellent with rhyme and the illustrations are stunning. Very helpful books for kids facing difficulties. Clever to combine the two stories and what an interesting collaboration combo. Yes, it is an interesting collaboration, but an effective one! The book is excellent. Ah, Lavar, the Reading Rainbow guy. His new release looks fantastic. Thanks for another wonderful review! Glad you enjoyed the story of little Rhino. Perfect book for counselors, teachers and parents. This book is expertly packaged. Beautiful book and review, Pat, as always. Great message and very helpful for kids feeling fearful. Glad you liked the book. Kids deal with tragedy every day — like the earthquakes near you that frigtened so many kids. That’s the kind of tragedy that Rhino addresses and helps kids and families find a way to cope and overcome fear together. I do love this title, and it carries a deeply significant, psychological these. It is sometimes too easy to swallow a storm. So great if children can talk about those feelings that would, otherwise, be buried so deeply and definitely make them feel really bad. Yes, it does carry a deeply significant psychological theme in a kid-friendly manner. Great book to have around with so much going on in the world. Love the cover! And the book sounds amazing. It seems to take a really scary subject and approach it in a way that will help a child deal with fears. The illustrations sound amazing. Yes, the cover is stunning. I know Susan had a lot of influence with the rhyming and has dealt with loss in other books. You’d enjoy her rhyming as it is engaging and not so scary. And yes, the illustrations are beautiful. Thank you Clar. I’m always searching for the right gems to share that will be helpful to a child. The book certainly is a great choice for the book shelf because it can help children cope with a variety of scary situations. I’ve been curious about this book, and now that you’ve recommended it, I’m going to check it out. Thanks for the great review, Patricia! I’m so pleased that you like my review and want to check out the book. Believe me, it is such a great book to have if you have children. The story, rhyming and illustrations make for really great collaboration. Like Joanne, I’m usually skeptical of children’s books written by people who aren’t usually considered children’s book authors. So it’s nice to see that this one overcomes that bias. Thanks for highlighting! This book is an excellent book to have on hand if you have young children. I love everything about this book. And, there are some excellent celebrity authors who are highly respected for their work — Julie Andrews, Henry Winkler, Maria Shriver and so on. And, LeVar has been an literacy advocate for a long time. You are right. I shouldn’t be so skeptical. Thank you for giving us an example of a good one! This sounds really good and an important topic. It is good to have something like a book like this to help kids talk about scared feelings they may have. Thanks for telling us about it! Looks like you’ve found another great one, Patricia. Hope my library has it. Love the title too! You will love the illustrations! They really compliment the story and give it more depth. What an image: a rhino swallowing a storm. thanks for sharing your thoughts on this book. I hadn’t heard of it before now. Thank you Sue. The illustrations are stunning and the rhyming beautiful. It’s a fairly new release. Well, wow! An unusual one for sure! I’ll have to sniff this one out! Thanks Ms Tilton. This would be a good “sniff” for your book bag Rhythm. Great book to get children to discuss fears in a safe setting!